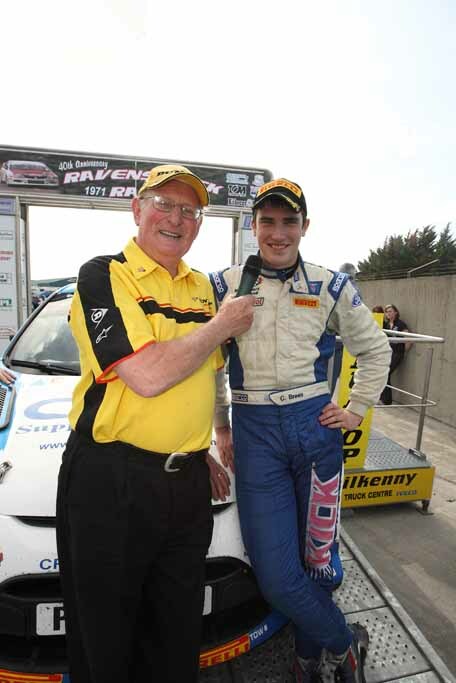 Venue: Old Mill, New Street, Carrick-on-Suir. For Stage 10 Sunday is Wallaces wellingtonbridge @7am. The fixing of door intrusion bars on both sides of the vehicle is compulsory (dual door intrusion bars will be mandatory from 1/1/16). They should not obstruct access to the front seats and not encroach on the space provided for the driver and co-driver. Hi All, the next meeting for the Youth Sports Project will be held on Thursday 21st of July at 8.30pm in the Old Mill. Over the past few weeks, Carrick on Suir Motor Club have been visiting Ard Scoil Na Mara in Tramore promoting Road Safety. 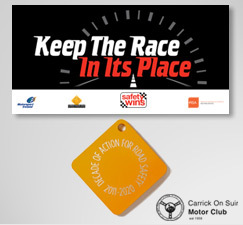 The Keep the Race in its Place campaign has been a project that Carrick on Suir Motor Club have been actively promoting since 2015. The aim of the program is to ensure that students from the various schools we've been to, and the schools we hope to visit over the coming months and years, are aware of the dangers. Each school we visit, we hope to save a life, if not more and to keep people safe. It is great to see a write up about us and we hope that everyone we have met thinks this is a worthy effort on all those who take time out of their jobs to do this.